One of my ongoing quests is to find an alternative controller for Animoog that would suit my playing style. This post focuses on the compatibility and capabilities of the Linnstrument and the ROLI Seaboard with Animoog now that Animoog supports MPE, aka Expressive MIDI. Animoog 2.4.0 released about a month ago brought support for MPE input with note-per-channel MIDI controllers. This changes everything. Everything when it comes for Animoog to support sophisticated MIDI controllers. What is MPE and why it matters so much? MPE is an extension of the MIDI standard that stands for the Multidimensional Polyphonic Expression specification. It is also known as ‘Expressive MIDI’. You’ll learn a lot more in this previous post a year ago about MIDI MPE’s development and its technical specification. In short, this new way of leveraging MIDI messages makes it possible to control the multiple expressive parameters of a single Animoog note over the same old MIDI cables. The ‘core MIDI specification’ wasn’t built to handle multiple dimensions per note. Dimensions in Animoog? Think of modulations such as the different polypressures or orbit rates for every note played. The LinnStrument by Roger Linn Design is one of the alternative controllers for serious players. Yes, it’s different from the MIDI controllers we’re used to, but don’t be afraid by this grid of lights, just look at how others play with it and you’ll understand why it attracts that much interest. Every cell will reacts to z-axis pressure as well as x / y-axises for vibrato and modulation. Pitch slides are easily performed on the LinnStrument’s x-axis. The Sonic Lab video below will show this to you. The LinnStrument also happens to be built and played by incredibly friendly people! I wanted to try the LinnStrument and Roger Linn himself nicely arranged a meeting with a LinnStrument owner in my home city of Montreal. That’s how I met with the wonderful Nathanaël last April. Nathanaël happens to work for the famous Moment Factory studio. He generously spent time with me on his LinnStrument, testing not only Animoog (which at the time didn’t support MIDI MPE) but also let me test how it feels to actually play on the LinnStrument. Thanks a lot Nathanaël! Unrelated to the LinnStrument, here’s a short video by Nathanaël showing Animoog controlling LED lights with note velocity and polyphonic aftertouch. Sonic Lab just released a 22-minutes video review of the Linnstrument, and guess what, it extensively features Animoog! :-) This video not only gives you an idea of the capabilities of the LinnStrument, Gaz Williams goes into the details of many of its features. This is a must-see video to anyone looking for an alternative controller for Animoog. Q: LinnStrument's rows always contain consecutive semitones (chromatic scales). Is it possible to set it so that the rows contain consecutive notes of a specific scale, for example only major scale notes while skipping over the accidentals? A: It is fundamental to LinnStrument’s design that each of the eight rows always contain only chromatic scales. While it is true that some controllers (like our Tempest drum machine) permit you to set consecutive pads to play only scale notes (for example, only major scale notes, skipping accidentals), this is really only useful for controllers with few pads like drum pad controllers or Ableton Push. However, LinnStrument has 200 note pads so it is not necessary to delete any notes of the chromatic scale. The problem with removing the notes outside of the scale is that you can't play them, which is useful in all but very simple music. There are other problems with non-chromatic scales: 1) you must always change the scales to play in different musical modes so you never get a chance to develop any playing skills because the notes are always moving. 2) Pitch slides will no longer be consistent, with larger jumps between note pads that are a whole tone apart than between those that are a semitone apart. 3) Vibratos on a pad with a semitone interval on one side and a whole tone interval on the other will be asymmetrical, bending twice as much on the whole tone side than on the semitone side. Instead of preventing you from playing accidentals, LinnStrument borrows an idea similar to the piano keyboard's black and white keys: it provides access to all the notes but highlights the naturals. By default, it highlights the natural notes (C, D, E, F, G, A and B) in green lights and highlights all “C” notes in light blue lights, but you can change it to highlight any scale and in any of 6 colors (red, green, blue, cyan, magenta or yellow). This is done in Global Settings / Note Lights. While I understand their valid arguments, I still think that it’s the single absent feature that stops me from purchasing a LinnStrument. The good news is that the LinnStrument firmware is open source, anyone can modify the LinnStrument’s software. Enthusiastic players could thus implement this features themselves. I thought of crowdfunding this feature with Bountysource for everyone to benefit from it. I went as far as creating this little explanation of what I was looking for. My recent discussions with the main LinnStrument firmware developer highlighted the following: “there are physical spacers between the rows of LinnStrument that prevent smooth transitions across cells in the vertical axis.” Despite this limitation, I still foresee this LinnStrument keys layout as valuable and being a useful way to play Animoog on it, similar to how we can configure Animoog’s keys on the iPad. 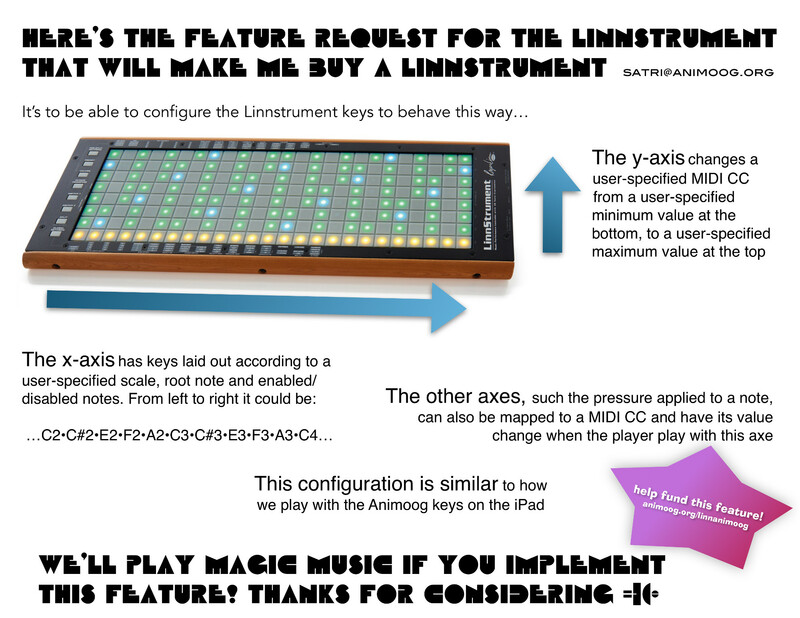 At this point, the LinnStrument developers aren’t interested in even maintaining this feature if we successfully implemented it. I of course respect their decision and it made sense to me to postpone working on crowdfunding this feature. But don’t stop yourself at my sentiment regarding this feature absent from the LinnStrument, the LinnStrument is clearly an excellent alternative controller and it usually pleases bass and guitar players because of its keys layout, Gaz Williams explains why in his extensive review. 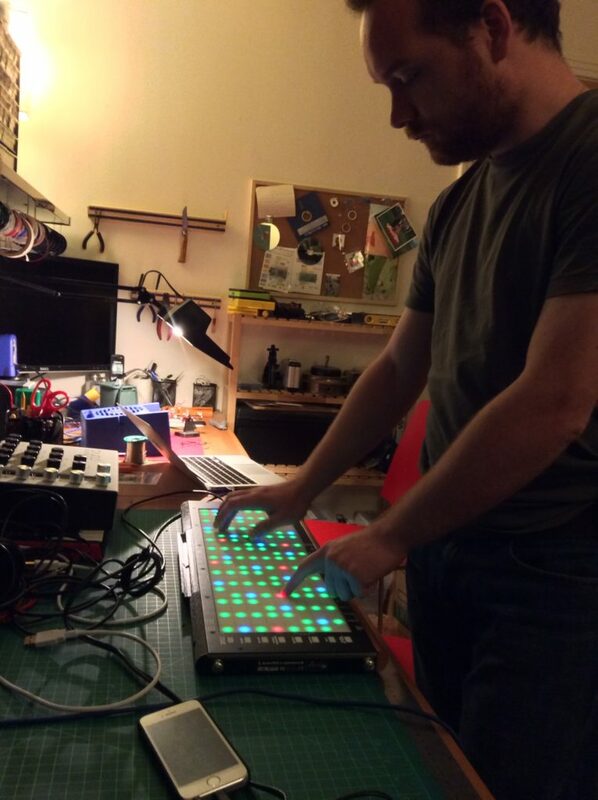 Here’s a nice LinnStrument track from Geert Bevin to give you a sense of how it can be played. The LinnStrument is available for $1,499 from Roger Linn Design. If you haven’t seen the ROLI Seaboard yet, I’m glad you’re reading this. One could dare think this keyboard came to existence to be Animoog’s companion. Let’s first have a quick look at what the Seaboard can do — notice the x & y gliding effects in the video, akin to the slides our fingers do on the Animoog keys on the iPad. The following impressive video successfully demonstrate the Seaboard capabilities with human-like voice. No wonder why the ROLI Seaboard won several awards! Anyone excited or considering a Seaboard should read the Sound on Sound Seaboard GRAND review which goes in depth and provides valuable details. Ok, but how does this the ROLI Seaboard sounds with Animoog? We’re very lucky, Steffen Presley, the sound designer who created the Song Haven pack of presets for Animoog, recorded the following video showcasing Animoog on the ROLI Seaboard Grand. The ROLI Seaboard has the scales physically locked to the piano scale, meaning my main reticence to adopt the LinnStrument is also valid for the Seaboard. Steffen Presley also warns us that playing micro-tonally, which was possible on the GRAND but never the RISE, is not an option anymore. Steffen provide the details in the description of the following video. Those interested in having access to this feature again should request it to ROLI directly. Can I have a ROLI Seaboard? You can and you have multiple options. The smaller ROLI Seaboard version available is named the Seaboard RISE, the 25-keys is priced at $799 and the 49-keys is $1,199. The latter is currently out of stock. I haven’t found a comparison of the RISE and its bigger brother the Seaboard GRAND, but the GRAND features more inputs and outputs and has different keywaves. It also costs more, the 37-keywaves GRAND Studio is $1,999, the 61-keywaves GRAND Stage is $2,999 and the ultimate Limited First Edition version featuring 88 keywaves is $8,888. For such an expense, you’ll probably want to try how a Seaboard feels like and sounds like before purchasing one. Here’s the worldwide map of ROLI Seaboard retailers. Trying one is the next step for me — despite the fixed scale, will I fall in love with it? Wrapping up this article, you might want to revisit this June 2015 article named Alternative Controllers for Animoog and the few posts on custom Animoog controllers. Now that we have MPE support in Animoog, the doors of the LinnStrument and the ROLI Seaboard are wide open to all Animoog players! This is accurate, but perhaps the most important difference is not stated. That is that the Seaboard Rise models are strictly MIDI controllers, whereas the Seaboard GRAND models have their own built in synthesizer, such that you can perform live with them without aid of a computer or MIDI device. This is certainly not obvious by their appearance, since are not really any on-board controls. The ROLI “Equator” soft instrument (now on PC as well as Mac), comes with all of the different Seaboard models. It is an extremely capable synth that perfectly compliments the Seaboards. With the GRAND models, a bank of 64 Equator presets can be created or edited on a computer and then be transferred to the internal sound engine of the Seaboard GRAND, ready for immediate live performance! This is also a big reason for the price difference. Ha! Thanks Steffen, I actually did not know that the GRAND can host presets directly on it — thanks for the precision. Good timing for your comment considering I’m readying a second post on the LinnStrument and the Seaboard.